The ThINKin' Spot: Peachy Pick Kit and New Stamps! Good morning on this bright, sunny and beautiful Tuesday! I've been having so much fun playing with the new Peachy Picks Kit that was released last week from Peachy Keen Stamps, and I've got several projects in the works. This is my first one to finish and I could hardly wait to share it with you! I used PK-297 Kiss Me Leprechaun for this card. The image was stamped with Memento tuxedo black ink, and colored with Copic markers. I added some sparkle to the buckles on the shoes and hat with my Spica glitter pens using the gold color, and I added a wee bit of sparkle to the hat band using the same pens in silver. The shamrock background paper was stamped using the PK-299 Lucky Day Shamrock background stamp. I inked it up really well with a Versamark clear watermark ink pad, and working quickly, while it was still good and sticky, I brushed the entire background with gold Pearl Ex powder. It created the most beautiful shimmery shamrock background, and the photo really doesn't do it justice. I do spray anything I use this technique for with a shot of aerosol hairspray to set it. The hairspray works great to keep the Pearl Ex from rubbing off, and as an added bonus, it makes your card smell REALLY good. The twine I used for the hand stitching and bow, the wooden banner, patterned paper, buttons and card stock are all a part of the Peachy Picks Kit for February, and I LOVE, LOVE, LOVE this kit!!! Here's a closer look at my card, and you can really see here, how pretty that shamrock background is using the Versamark and Pearl Ex technique. I aged this wonderful newsprint paper quite a bit with some Tim Holtz distress ink in Vintage Photo. I crinkled the paper in the oval up and inked it, to make it REALLY look distressed. 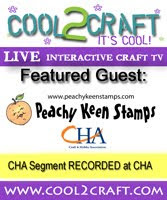 Head over to the Peachy Keen Stamps store to check out all the new stamps, and to find out the details about the Stamp of the Month Club, as well as the Peachy Picks Club. Both are subscription based clubs, and will have peachy happiness arriving in your mailbox on a regular schedule. Now THAT'S lucky!! Thanks so much for stopping by today! Wishing you a blessed and beautiful day filled with happy stamping! Wow! Wow! Wow! Lorie, I always marvel at your awesome creativity and this card just exceeds all expectations! As usual your coloring is exceptional and this little leprechaun is a delight. Love the extra touches with the spica pen. And LOVE!LOVE!LOVE!the shamrock background created with Pearl Ex, versamark, ink and that terrific Peachy Keen background stamp. All the details from the distressed d.p. to the twine box and buttons make a FANTASTIC CARD!!! Lorie my little treasure! This is SO gorgeous. The backgorund is so pretty. You did a wonderful job with that technique. The whole card is SO very lush!!! Love it my friend. wow Lori, this is fabulous. Awesome coloring and fabulous details. Fabulous little leprechaun! I love how you colored it! OMgosh Lorie this is sooo DARLING!! I love your coloring on the sweet Leprechaun, he is just tooo cute for words..Also love your coloring and highlighting!! Beautiful job! So...just when I think you can't out do your own awesome self...you make this MASTERPIECE!!! Seriously, i quit. HA. YOU ARE AMAZING!!!! !